Spectacular Christian Gladu Design modern-contemporary home in the heart of Bend, featuring upscale furnishings, European style bedding, fully equipped gourmet kitchen and original artwork. Fantastic location! Walk to restaurants, pubs, shops, Drake Park, the river trails, and all the best of Westside Bend. Soak in the hot tub, ride a cruiser bike. The location is fantastic! Walk a few blocks to 10 Barrel Brewing Company, Ariana Restaurant, Mother’s Juice Bar, and plenty of other wonderful shops and restaurants. Meander through Bend’s historic neighborhoods to the heart of Downtown, Les Schwab Amphitheater, the Old Mill and the river trails. Boasting a fabulous architectural layout that provides plenty of privacy as well as gathering areas for family and friends, this home has an open floor plan with high ceilings, windows, hardwood floors, original art work, and gorgeous finishes. Enjoy the comfy and hip upscale furnishings with artistic touches and treasures. Cozy up to the gas fireplace and watch a movie on the HDTV. Cook an unforgettable meal in the fully equipped gourmet kitchen with family and friends. Or, step out onto the patio and enjoy outside living “Bend style”. Cook out on the gas grill, or relax in your own private hot tub under a Central Oregon sky filled with stars. The soothing sounds of water from the pond enliven this private, tranquil setting! High quality mattresses and European style bedding make for a great night sleep! High thread count linens, down duvets… the key to a great vacation. There is a Queen sleeper sofa in the entertainment room with linens supplied for your extra guests. • Amazing location WALK EVERYWHERE! This house was perfect for us! The kitchen was top-notch and we enjoyed cooking in it very much. There was plenty of room for the 5 of us and the hot tub was perfect after a day on the slopes. The location was perfect as well as we could just walk to the breweries and restaurants and a short Uber to downtown. We definitely would rent this place again! Also the staff was very responsive when we ran into a small issue with the hot tub. They responded immediately and we lost no time using it! Thanks for a great stay! Excellent location. Within a short walk from many great brewpubs. We loved everything about our stay! Beautiful home was clean and comfortable for all, with a well stocked kitchen, all in in ideal location for all that Bend has to offer. We will gladly stay here again! Artist retreat is a beautiful place for a getaway weekend. The hot tub was a hit! The host made everything very easy and accessible! The home was clean and exactly as we though it would be! I would highly reccomend this home for a visit to Bend. House was great! Nice location near our favorite breakfast spot, Victorian Cafe! Walked to Starbucks and Safeway as well. House was perfectly appointed with all kitchen & bathroom supllies, as well as extra bedding and blanets for those cold fall and winter nights! Wonderful house, would rent again! This house was absolutely beautiful and wonderfully maintained. We will definitely be back to Bend and will be looking forward to staying in this house again. Lots of room for the 6 of us to enjoy. The open living area was great for our familys relaxing time together. This house is very well cared for and thoroughly enjoyable as a place to stay while on vacation or while attending an event as we did. 5 of us stayed for 3 days during the "Art in the High Desert" art show. We enjoyed a relaxing time in this spotless, spacious, comfortable, well-appointed, and relaxing home. We enjoyed the hot tub, the outside table in the front, and the comfortable living space. The 5 of us loved being able to stay together in a roomy space and spent time together cooking, eating, talking and relaxing. We couldnt have enjoyed it more and look forward to returning in the future. 100% satisfied. The home was pristine inside and out. We used everything (WiFi, TV, games, grill, hot tub, kitchen, notebook with local recommendations, etc.) and it all worked fine. My guests repeatedly said how much it improved our trip to be together in a nice house, rather than saving a few $$ and staying in hotel rooms. Tubing the river, the Tumalo Falls hike, and lunch at Spork were some highlights of our weekend. We stayed for a long weekend (3 generations). This is an immaculately clean well equipped home. We had family meals and everything we needed for preparing and serving our meals was there (including a booster seat for our grandchild). The bedrooms are wonderfully decorated and the linens provided are high quality. 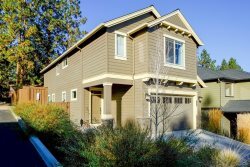 Close to everything - grocery stores, restaurants, quaint downtown Bend, the river and The Mill shopping center. Loved the hot tub and beautiful backyard with a bbq. The front yard dining table area was perfect. As for the Bluebird Day staff, they were great. They were courteous, helpful and responded promptly when I had an question prior to our arrival. We would definitely stay here again! Beautiful property, maintained to the highest standards, immaculate, they thought of everything with the great amenities (hot tub, yard, well appointed lovely kitchen, cruiser bikes, bath products, towels and linens)! Location is great - either walk or bike to local restaurants, riverfront, bakeries and more. You will not be disappointed! I have used Airbnb many times and this was the most enjoyable experience. Blue bird made the stay simple and very relaxing. House was in perfect shape and very very clean. Cant be the location. Will be going threw bluebird again and look forward to my next stay. The artists retreat is great house, very well located on the west side of Bend. Walking distance to everything. The house is well equipped with everything you could possibly need. The management is exceptional - the house was immaculately clean and all the special touches (from freshly ground coffee from a local coffee roaster to the soaps, shampoo etc) were fantastic. It made our stay. Our time in Bend was too brief, but this home was perfect for 4 adults and 2 teenagers during our stay. It is in a great location - within walking distance to several great restaurants. It is beautifully decorated and comfortable . . . the teenagers enjoyed the hot tub! The home is well appointed and the Bluebird was very accommodating to get us whatever we needed. The home is located on the west side within walking distance to numerous places within blocks and a short walk to downtown. I worked the week we were in Bend and brought my family. We had a great time and will definitely rent this house again. I cant wait to Vacation in Bend, Oregon AGAIN!!! Check your email for check-in instructions and property details!